But new research at Washington University School of Medicine in St. Louis shows that those improvements are related to weight loss alone and not to the surgical procedure itself. Gastric bypass (top) reduces the size of the stomach and re-routes food to lower in the intestine. 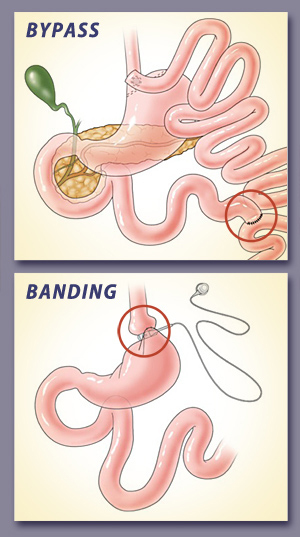 Gastric banding (below) places a ring around the upper portion of the stomach to make it smaller. In a study comparing gastric bypass to laparoscopic adjustable gastric banding, the researchers report that although both procedures help patients lose weight, gastric bypass does not provide additional advantages for improving the secretion of insulin or the body’s sensitivity to insulin in obese patients who don’t have diabetes. The study is available online in the Journal of Clinical Investigation. Klein, the Danforth Professor of Medicine and Nutritional Science, directs the Division of Geriatrics and Nutritional Science and the Center for Applied Research Studies as well as Washington University’s Center for Human Nutrition. His team gathered data from 20 patients at Barnes-Jewish Hospital in St. Louis. Half had gastric bypass surgery and half had adjustable gastric banding. The researchers measured the ability of the pancreas to secrete insulin after a meal. They also evaluated the ability of muscle tissue to metabolize blood glucose in response to insulin before surgery and again after patients lost 20 percent of their body weight. All of the people in the study had been extremely obese before surgery, but none had type 2 diabetes. Bariatric surgery, such as gastric bypass and gastric banding, helps patients rapidly lose weight and often brings type 2 diabetes under control. Gastric bypass reduces the size of the stomach by more than 90 percent and re-routes food lower in the intestine. Gastric banding places an inflatable ring around the upper portion of the stomach, making it smaller. The bypass patients also experienced rapid absorption of glucose after a meal, causing more insulin to be produced. Klein says that seems to be a unique metabolic feature in gastric bypass patients, and the clinical effects of the spikes in glucose and insulin are not clear. What is clear, he adds, is that weight loss following both types of surgery improves metabolic health. Funding for this research comes from the National Institute of Diabetes and Digestive and Kidney Diseases (NIDDK) and the National Center for Research Resources of the National Institutes of Health (NIH). Additional funding was provided by a grant from Ethicon Endo-Surgery and the Atkins Foundation Philanthropic Trust. NIH grant numbers DK37948, DK56341, UL1 RR024992 and RR00954. 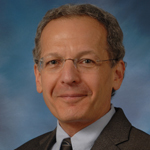 Samuel Klein serves on a scientific advisory board for Ethicon Endo-Surgery.